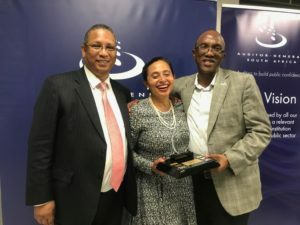 Artscape Theatre Centre was presented with its clean audit award trophy by the Auditor-General Kimi Makwetu at the local Cape Town office on Tuesday, 02 April. The Clean Audit findings by Makwetu covers the financial statements of Artscape as an agency of the Department of Arts and Culture, as at 31 March 2018. 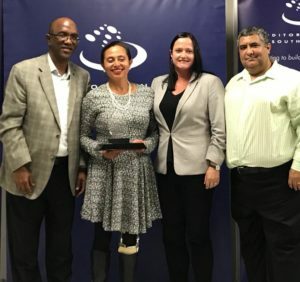 Le Roux dedicated the award to all Artscape employees describing herself as “the mere conductor of this incredible orchestra called Artscape” while lauding the main players – the staff- for “hitting the right notes all the time”. Equally instrumental in this “incredible orchestra” is the Artscape council led by Chairperson, HRH Princess Celenhle Dlamini. “Let us continue to play in harmony and produce the right outcomes,” she underscored.